The 57th Lord of the Nerds! Now having returned into a form of the flesh Vamaer, now known as Randir ,would have returned to the place where his soul feels the most at peace. The Indar Forest. His ears flicked as he strode forth though the thick brush with ease, hearing the Song of the Forest, he called it. The forest was slowly recuperating from the Spider's taint, and it brought a gentle smile to his tanned face. Though his feet would lead him back to the clearing where one of Foli's Towers had fallen. He hoped that this area would allow some divine prayer to trickle through to the King of Heroes' Demi-servants. Setting his satchel down he'd begin his little session by stabbing his blade into the center of the clearing, leaning The Protector against the flat of the blade. That would serve as the center of his ritual circle. He'd then begin setting different points of pale incense about the space, setting them alight and filling the area with the smell of vanilla and lavender. Then salt would be moved to trail and connect to the other incense sticks and create a small ritual circle in the clearing. 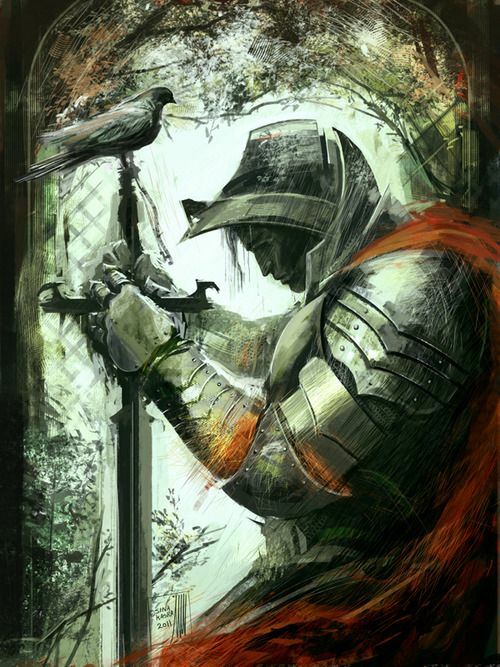 When such was completed he would move behind his blade, taking a knee behind the blade and the shield as his hands clasped against the pommel. Then his voice would call forth as he began the prayer with a respectful tone. He did not expect an answer to his prayers. .but he tired of being useless. "Beneath the setting sun I call to you, Archangel of Wisdom. You know not whom I am, yet I call you by name, Germael in this troubling time. The Spider's influence still causes the land to stink of corruption and it saddens me to say that I am not as useful as I was in another life. In service to another Lord whom used your council. I plead for an audience, Archangel Germael. .as I seek guidance. My blade is lost without a righteous calls to rally as I am but a mortal man. Many more capible than I strike down the Towers. .- I wish to do the same." He did not expect an answer, yet he prayed anyways. He prayed to at least try and plant a seed of hope that something GOOD was listening, yet his body was poised to raise his blade if something. .otherwise would answer his prayer. He would rather have no answer at all than. .a tragic visit. @Kyle1322 and @monomyth if either of you deem this relevant to read or even REPLY (which I doubt). Hope it was a good read! Moments would pass in the circle in silence as his eyes followed the fleeing dove, as a dampness began to tickle at his cheeks as his vision blurred. After so long. .finally he had gotten some sliver of an answer. It was clear that despite his joyful weeping. . . Randir's soul was ignited with a righteous fury. He was heard. .and his faith in the Lord Protector was noted. After taking his time to weep, he'd allow the ritual site to remain as he acquired his belongings and headed home.